Dubai: Pakistan’s Prime Minister Imran Khan launched the Spring 2019 tree plantation drive as part of the 10 billion tree tsunami today. Khan had announced the 10 billion tree tsunami last year, soon after he took office, and today he tweeted about the inauguration. 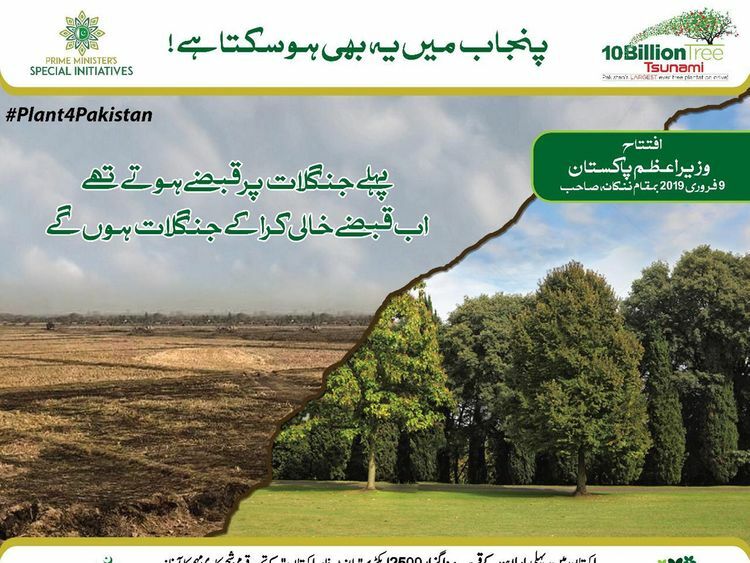 @ImranKhanPTI: We are launching our #Plant4Pakistan programme and reclaiming mafia encroached land, converting it into forests and wildlife parks for our future generations to fight climate change and pollution. The day will be marked across the country with several Pakistanis participating in the drive. On social media, people shared the message encouraging others to participate and #Plant4Pakistan became a trend across the country. In a television interview to Pakistan’s Hum News, the Minister of Climate Change Malik Amin Aslam said that it was the Prime Minister’s vision to reclaim the land that had been taken over by the land mafia. Khan has been an advocate of environmental conservation for quite a long time. When his party - Pakistan Tehreek-e-Insaf (PTI) – was in power in the province of Khyber Pakhtunkhwa, his government planted one billion trees in two years.